This all-in-one heavy duty fiber optics, ethernet cable and telephone wire crimping tool is designed for Western Electric (WE)/Stewart Stamping (SS)-type, 6-and 8-position modular telephone plugs, rj45, cat5 cables, coaxial cable - and more. 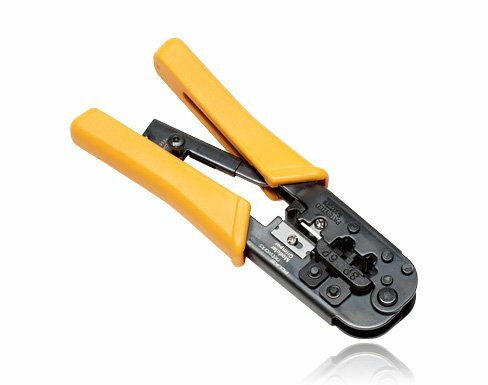 Fluke Networks modular RJ45 crimper tool improves your efficiency and productivity of network cable installation. For ease of use, our ethernet cable and telephone wire crimping tool ratchet-controlled and features an embedded flat cable cutter and stripper.